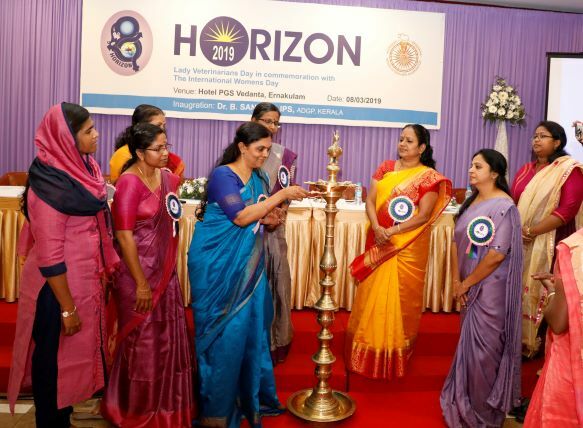 The international womens' Day is commemorated as Horizon-2019, The Lady Vets Day by Indian Veterinary Association, Kerala at Hotel PGS Vedanta, Kochi on 08.03.2019. ADGP of Kerala Police Dr. B. Sandhya inagurated the event, presided by Dr. Manju P.M., Vice President, Indian Veterinary Association, Kerala. Dr. B. Sandhaya applauded the social security initiatives took up by IVA Ernakulam Unit, in connection with the Lady Vets Day program. Kerala State Veterinary Council Member Dr. N. Usharani inaugurated the seminar. During the function, eminent lady veterinarians were honoured by Dr. C. Latha, Dean (i/c), COVAS Mannuthy. Successful women farmers of the state were also honoured. Different sessions of the seminar were handled by Dr. Divya Oommen, Clinical Psychologist, Rajagiri Hospital, Aluva and Dr. Annie Varghese, Asst. Director, AHD Thiruvananthapuram. Dr. Sethulakshmy C. Nair, Deputy Director, SCMS Kochi was the moderator of the seminar. Dr. Claire R. Cecil, Joint Chairman, Horizon-2019, Dr. Akhila G.M., Dr. Saira P.A., Joint Convenor spoke during the occassion. The seminar was followed by cultural programs arranged by lady vets from different districts. In connection with Lady Vets Day, the Ernakulam district unit of Indian Veterinary Association Kerala implemented social security scheme in the worst flood affected panchayath, Karumalloor. Poulty and Goat units were distributed to more than 500 women farmers of the panchayath. The polutry project was implemented in association with Kerala Poultry Development Corporation. Smt. J. Chinchurani, Chairperson, Kepco inaugurated the event.